Here are 14 facts about how New Yorkers experience the heat and its effects. Heat can kill quickly: Most NYC residents die the same day of being affected by a heat-related illness. Heat at home kills: NYC residents are eight times more likely to die from heat at home than on the street. Chronic health problems worsen heat’s impact: Most NYC residents who die from a heat-related ailment also suffer from some form of cardiovascular disease. So does obesity: More obese NYC residents are more likely to die from a heat related illness. And substance abuse: The second most common factor leading to heat stroke in NYC, right behind cardiovascular disease, is substance/alcohol abuse. Diabetes is linked to harm from heat: More than one quarter of adults suffering heat-related deaths in NYC in 2013 had a history of diabetes. So is mental health: More than one fifth of adults suffering heat-related deaths in NYC in 2013 had a serious mental disorder. NYC’s blacks are vulnerable: From 2000 to 2010, nearly 50% of those affected by heat-related deaths were African Americans. 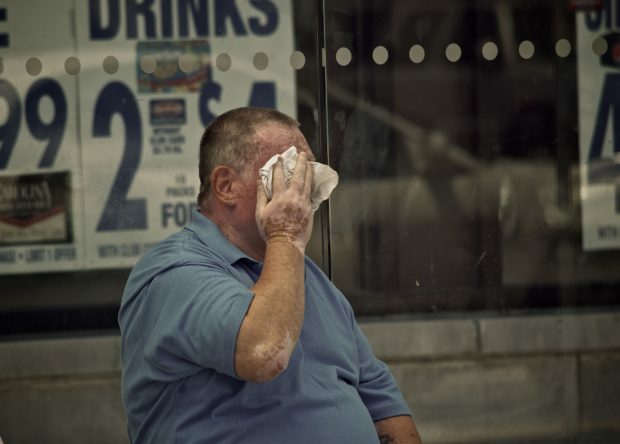 So are NYC’s elderly women: Female residents above 85 are nearly four times as likely to visit the hospital for a heat-related ailment than men. But men are vulnerable too: Almost twice as many males than females died in 2013 from the heat. Brooklyn has more heat deaths: The borough had the highest number of heat-related deaths in 2013. But Harlem has more heat-related illness: Harlem neighborhoods have a much higher rate of ER visits due to heat stress – as high as 17.6 per 100,000 residents – than the city-wide rate of 9.4 per 100,000. Harlem has fewer ACs: Harlem neighborhoods have a lower percentage of adults with air conditioning, between 84.3%-87.2%, than NYC as a whole at 87.7%. Harlem seniors have even fewer ACs: Some Harlem neighborhoods, such as East Harlem, have a significantly lower percentage of seniors with air conditioning than NYC as a whole, just 76.8% versus 87.7%. Posted in Extreme Weather, Harlem Heat and tagged with climate change, Harlem, health, heat, heatwaves, resilience. RSS 2.0 feed.